In the past ten years, the U.S. has seen a dramatic increase in the number of high-income renter households, from 3.8 million in 2008 to 5.7 million in 2017. Nowhere has this surge been seen more than in Denver. 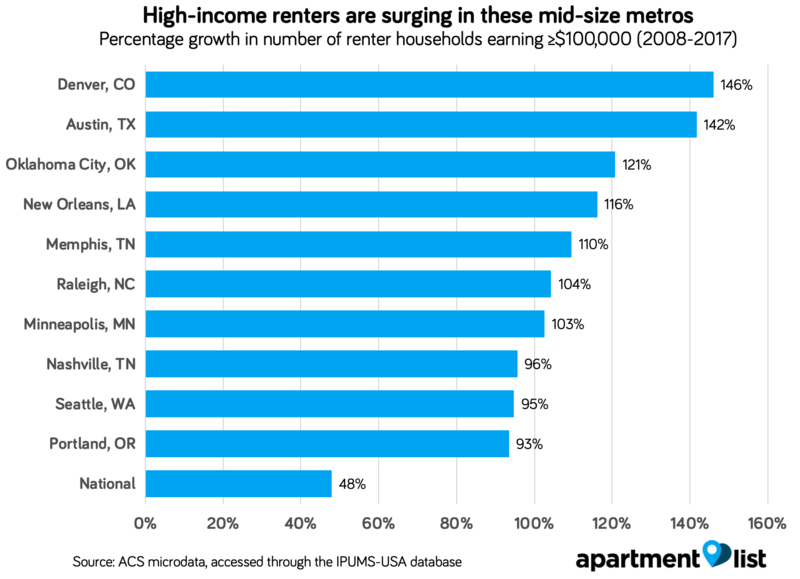 Denver and Austin lead the nation in high-income renter growth. These metros housed nearly 2.5 times more six-figure renter households in 2017 than they did in 2008. ApartmentList.com, documented four factors that led to this boom and we had one. The recent boom in multi-family construction, the growing abundance of single-family home rentals following the Great Recession, increasing barriers to homeownership, and rising demand for both centrality and flexibility. We also see the legalization of marijuana in Denver. (For a good take on marijuana and money, check out this blog 420finmgmt.com) The result is that a combination of new, appealing rentals (growing supply) and an increase in the relative ease and attractiveness of renting (growing demand) are reinforcing one another. What does this mean in the long term for the Denver Real Estate market? The trend may be indicative of changing norms around how we pay for our housing. If today’s high-earning families increasingly value the centrality of living in cities or the flexibility of renting instead of owning, meaning we could see continued price pressure on homes.